On this page AutographsForSale.com offers dozens of authentic hand-signed autographs from women's soccer stars on cards, jerseys, photos, magazines, soccer balls and other items. 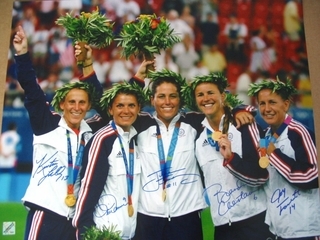 Featured at right is an autographed poster size 16x20 inch photo of the five original 91ers (Brandi Chastain, Joy Fawcett, Julie Foudy, Mia Hamm and Kristine Lilly) posing with their gold medals won at the 2004 Olympics in Athens, limited to 91. We have a wide selection of other autographs from these five greats and many other current and former U.S. Women's Olympic Team, U.S. Women's World Cup Team, WPS and WUSA soccer stars. Heather Mitts autographed 1999 Sports Illustrated for Women magazine inscribed Best Wishes!